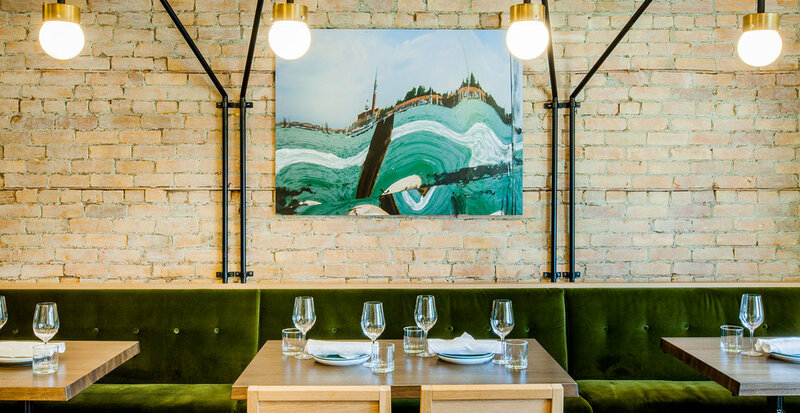 Showcasing the building’s 100 years of history with exposed brick, green velvet booths and white oak chairs, the interior has been impeccably designed as a modern comfortable atmosphere for any occasion. The restaurant can be separated into three separate rooms for booking, our front room with bar seats 50, the middle semi-private room seats 25, and our private dining room can seat up to 28 guests. We offer four menu options to choose from, which vary from a simple lunch, a three course dinner, or a five course family style dinner. Download our event package below to learn more.